Dates for the 2019 Session are May 19 – 31, 2019. Students should plan to arrive on campus by 5:00pm, Sunday, May 19, 2019 to register and to check into their apartments. Dinner will be served from 5:30pm until 6:45pm. Sunday evening classes for seniors begin at 6:30pm, junior class begins at 6:45pm and the freshmen class begins at 7:00pm. Daytime classes are scheduled Monday through Friday from 8:15am until 11:30am, and from 1:15pm until 4:30pm. Evening classes begin at 4:45pm and are generally completed by 5:45pm. On Saturday, May 25, classes end at noon for all students. First year students must be back on campus by 7:00pm Sunday, May 26 for case work. Juniors and seniors do not have class until Monday, May 27 at 8:15am. Seniors are free to leave after graduation exercises which should be concluded by 12:00 noon on Friday, May 31. First and second year students should complete their final examinations by 10:00am on Friday, May 31. Buses will begin transporting bankers to the airport after exams on Friday until 1:00pm. Apartments close at 1:30pm. Asset/Liability Management provides a basic understanding of a bank’s techniques to measure and manage interest rate risk. Discussion focuses on the responsibilities of a bank’s asset and liability management committee, the sources of interest rate risk, and tools to measure the sensitivity of earnings and market value of equity to changes in interest rates. Topics include: the repricing (GAP) model; duration; economic value of equity; simulation models; and balance sheet adjustment and hedging techniques. Credit Risk Management introduces students to credit risk management in the lending function. Comprehensive credit risk management requires that banks identify and measure risks in the portfolio, develop appropriate policies, procedures, systems and controls to manage and monitor risk and assure that they are working. Portfolio credit risk management is a tool to improve the predictability of portfolio credit quality during economic cycles. A bank study project provides students with an opportunity to assess their institution’s tolerance for risk, to develop a risk profile and assess their institution’s control environment supporting their credit management process. An overview of financial markets and institutions. Topics include the role of intermediaries, the nature and functions of money, a review of the time value of money; the level and structure of interest rates; interest rate risk versus price risk; money market and capital market assets; diversification; and the role of derivative assets in risk management. 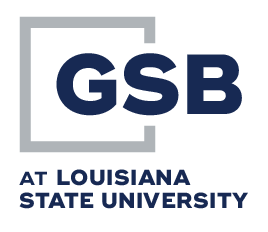 This course is designed to provide foundational finance knowledge for the remaining coursework at the Graduate School of Banking at LSU. Monetary Economics is designed to assist the banker in analyzing and explaining economic conditions and forces. Topics pertain to the entire banking and economic system, but relate directly to risk management, A/L composition, and other decisions made within the bank. The course addresses the effects of policy decisions on financial markets; it takes participants “inside” the Federal Reserve as they learn how monetary decisions are made and implemented. The course provides a practical framework for determining how fiscal and monetary policies affect global, national, and local economies. Other topics include: economic measures and indicators, regulation, interest rate risk, and the trade-offs associated with economic decision making. Strategic Bank Marketing focuses on competitive strategies that banks can use to attain strategic, sustainable advantage and achieve superior, long-term profitability in spite of industry or environmental changes, competitor actions, technology enhancements, and customer/market shifts (including generational shifts.) Customer-driver differentiation that leads to increased customer satisfaction and retention is the essence of such competitive advantage strategies. This course focuses on developing effective strategies through identifying key drivers of profitability, new innovations and disruptive technologies, and through identifying and measuring the Competitive GAP’s which limit a bank’s ability to enhance performance and profitability. The relationship of marketing strategies to other functional areas of the bank and to the marketplace is emphasized, as are specific, practical techniques to help bank managers. Intermediate Credit Analysis is an advanced course designed for the student with commercial lending experience who has a working knowledge of accounting and ratio analysis. Emphasis will be placed on refining those techniques, which lead to sound commercial lending decisions and becoming a value-added lender. This includes analysis of ratio trends, working capital, cash flows, developing and using a cash budget, and other important elements in commercial lending operations. The Bank Regulatory Law course is designed to assist bankers in meeting the challenges of the rapidly changing regulatory environment. Topics include regulatory enforcement actions, mergers and acquisitions (including FDIC assisted deals), bank secrecy act, C.R.A., fair lending, bankruptcy, lender liability, and survival tactics for the new financial services industry. Attention is also given to current and proposed legislation as well as discussing the future of the financial services industry. Banking Small Business is tailored for all bankers who have contact with business owners, and it is unique because it focuses on both sales and credit training together. The course discusses how to call on and effectively serve small business clients and build and sustain relationship banking. It is both practical and hands-on, as it uses actual case experiences and role plays to reveal the problems of entrepreneurs and gives bankers the tools to understand and communicate with non-financially oriented owners or managers of businesses with sales under $15 million. This course provides insights into small business owners’ expectations and attitudes that help create the ability to add value to customer relationships. Managing Bank Performance focuses on two facets of measuring and managing bank performance, and all models, strategies, and discussions prepare students for the Bank Management Simulation course which is completed in the third year of the school. The first portion of Managing Bank Performance identifies the various drivers of bank performance which includes measurement of the drivers and discussions as to how the drivers can be used in concert with each other to achieve the desired goals of profitability. Additional discussions demonstrate how and why these drivers differ between banks of different sizes in the banking industry. The objective of the second portion of the course is to identify the various risks faced by banks and to develop strategies for managing these risks for the purpose of achieving greater returns. The primary risk subjects to be discussed include interest rate, liquidity, credit, and operational risks. The course includes extensive discussion of Asset/Liability Management modeling inputs and outputs, including the development of assumptions, and the ALM models are presented from the viewpoints of bank management and bank regulatory oversight. Financial derivatives as used in managing bank risk are also presented. Risk Management and Cybersecurity is designed to equip bankers with the tools to recognize and manage risk in a rapidly evolving cybersecurity landscape. Banking is all about managing risk. Today’s banker needs to understand the unique risks and threats in today’s cyber-world due to rapid advances in technologies that are critically leveraged in every area of the bank. Topics include managing risk, risk assessment process, risk appetite, cyber-insurance, vendor management, law and regulations, emerging threats, business continuity planning, and incident response. Specific attention is given to breaches, ransomware, phishing, advanced persistent threats, corporate account takeover, and cloud security. Treasury Management is designed to provide student with an understanding of corporate treasury management practices, regulatory and oversight issues, treasury management products/services, and customer financing/borrowing instruments. This course focus is to see your bank’s operations in treasury management from the customer’s perspective; understanding how treasury management can play a key role in determining your bank’s competitive position. This course includes extensive discussions in the following areas: (1) Disbursement practices – to include the use of controlled disbursement, positive pay, ACH debits, B2C transactions, C2B transactions, B2B transactions and purchasing card practices – to name a few. (2) Collection practices – to include retail and wholesale lockboxes, remote deposit capture, ACH credits, processing web-based payments – to name a few. (3) The U.S. payments system and how it works – to include in-depth discussion of all the players who have a stake in our payments system and the laws that impact bank operations (the Federal Reserve, Office of the Comptroller of the Currency, Regulation P, Bank Secrecy Act, OFAC, EFAA of 1987, to name a few. (4) A discussion of how short-term investing and short-term borrowing are used as strategies in today’s treasury operating environment. (5) A discussion of fraud exposure and control – to include a discussion of identity theft. (6) The when, why, and how of using interest rate swaps, call options and put options – in a word, derivatives. The learning atmosphere is highly interactive, informative and entertaining. Be prepared to actively participate in the discussions of the above topic areas and to contribute your knowledge and experience for the benefit of the total class. Commercial Real Estate Financing focuses on the state of CRE (Commercial Real Estate) industry, the techniques used to analyze, finance, and structure real estate transactions, and the current regulatory environment. The course commences with an overview of the principles of property valuation, and quickly moves into coverage of multifamily, office, retail, industrial, and hotel underwriting and lending. CRE sector performance is discussed concurrently and is followed by a review of the current perspective of regulatory bodies on lending concentration issues and specific sector risks. The course ends with instruction on how to create a CRE market intelligence model for your own bank that can strengthen underwriting, identify lending opportunities, and satisfy the demands of regulatory entities. Bank Management Simulation utilizes a computer-based learning exercise designed to give participants an overview of the bank management decision-making process. Students develop strategies for the management of functional bank areas, with specific emphasis on planning and decision-making in areas such as loans, deposits, investments, funds management, asset/liability management, risk management, etc. The primary focus is on profitability and growth, but attention also is directed to marketing, the pricing of bank services—both current and future, and the management of risk. The senior class is divided into teams, with each team effectively managing an $800 million dollar bank. The computer model allows students to make decisions, to receive quick feedback on the effectiveness of their decisions, and then to make new decisions which adjust bank operations to compensate for a large number of internal and external forces including competition, the economy, and regulatory constraints. Within a two-week period, simulation teams experience the equivalent of two years of bank operations. The course is supervised by qualified instructors who have extensive real-world banking experience as CEOs, presidents, or examiners. The computer model, (BMSim) or Bank Management Simulation, was developed by the ABA and currently is maintained by a consortium of regional banking schools. The commercial banker must interpret domestic and global change and adjust to changing business conditions in all aspects of banking practice. Bankers are provided with the practical knowledge and basic tools needed to assess the overall economy and its effect on institutional risk and financial performance. The course includes an analysis of major banking trends associated with economic, competitive, regulatory, political, and social change. Special attention is given to aspects of economic indicators, both domestic and globally, that impact bankers’ decision making and strategic planning processes. Is it as important to be an effective leader outside your organization as it is inside your organization? Is there such a thing as ethical leadership? Should good leaders make good managers? What are the pitfalls to effective leadership? Is communication broken or just slightly cracked? We explore the answers to these questions and more as we focus on tips and tools to help bankers understand “self” and the impact “self” has on the thoughts and actions of others. We also focus on issues leaders face such as managing people, dealing with conflict and being a good steward in the community. Here is a question to ponder? When it comes to leading and managing, are you a Lion, a Fox, a Clydesdale, or a St. Bernard? Is it as important to be an effective leader outside your organization as it is inside your organization? Is there such a thing as ethical. The banking industry is in the spotlight and Leadership in Times of Change engages the participants in an interactive learning process aimed at leading through the current crisis. Leadership theories that have dominated our thinking and practice for the last century are presented and summarized into a relevant whole that provides a firm foundation for today’s leaders. Leadership styles are presented and assessed, and leadership levels are linked to effectiveness in today’s tough markets. Exercises and tools for leading organizational change are presented to help leaders succeed in today’s complex organizations and business environment. A model for personal leadership development is presented for participants to continue their life-long process of growth. Commercial Real Estate Financing focuses on the state of CRE (Commercial Real Estate) industry, the techniques used to analyze, finance, and structure real estate transactions, and the current regulatory environment. The course commences with an overview of the principles of property valuation, and quickly moves into coverage of multifamily, office, retail, industrial, and hotel underwriting and lending. CRE sector performance is discussed concurrently and is followed by a review of the current perspective of regulatory bodies on lending concentration issues and specific sector risks. The course end with instruction on how to create a CRE market intelligence model for your own bank that can strengthen underwriting, identify lending opportunities, and satisfy the demands of regulatory entities. Leading through Advocacy highlights the importance of local, state and federal advocacy for all bankers and how advocacy can significantly impact the banking industry. The course covers advocacy best practices and examples of successes obtained through state and federal advocacy initiatives in the last ten years. The role of state and national trade associations in advocacy initiatives is examined as it relates to achieving success for banks. This interactive course is designed for those in bank leadership roles and underscores the purpose of grassroots banker involvement in political campaigns and policy discussions. Mergers and Acquisitions is divided into three parts—the first deals with the financial, regulatory and social aspects of mergers, the second is concerned with the implementation of the process, and the third relates to the integration and personnel aspects of a merger. Financial and economic considerations include the determination of the cash price or stock exchange ratio and comparisons between the two methods. The implementation takes the process from the pricing phase to the determination of terms and conditions. Critical personnel issues such as job reassignments, terminations and consolidations of positions, and the changes in “corporate cultures” are addressed in practical terms. The course also focuses on the challenges of remaining independent. Negotiate to Win for Bankers is a no-nonsense, highly interactive, “how-to” program that combines short input lectures, exploratory discussions, realistic exercises, and feedback to deliver a rapid and dramatic improvement in negotiating skills. The course equips bankers with the very latest negotiating best practices, an in-depth understanding of how and why they work, and the confidence to put them to immediate, profitable use. As banks struggle with unprecedented regulatory, economic, technological, and competitive challenges, effective negotiating has emerged as a make-or-break career competency. Whether it’s bargaining with customers over rates or structure, supporting credits through the approval process, dealing with staff performance problems, sorting out compliance issues with regulators, or simply managing everyday differences with colleagues and clients, our effectiveness at most of the things we do is critically impacted by how well we negotiate. In a series of real-life cases, Recruiting and Retaining the Right Employees presents specific steps and skills which help managers to be effective in these areas: 1.) Attracting employees who fit the job and the bank, 2.) Connecting individual skills and styles to organization goals, 3.) Managing individuals and teams both proactively and reactively, and 4.) Creating job and career paths for all performance and motivation levels. Bankers understand and apply successful interview questions, goal setting steps, team dynamics, group communication and individual coaching to a series of actual bank situations. Special attention is given to talent sourcing, under-performing employees/departments, individual motivation and career path development. Fast paced and hands-on, this 5-part series applies a practical, human element to the school’s overall curriculum of risk, regulatory and fiscal management. Managing Different Generations within the Workforce. A mixed group of faculty, staff and students will discuss strengths, weaknesses, motivations and stereotypes of the primary 4 age groups employed by banks today. Bring your questions and challenges and an open mind. Rural and Small Business Lending examines the domestic and global megatrends that impact credit risk and business development opportunities in your rural and agricultural enterprise businesses. Consumer and population trends, rural and agricultural structure, real estate values and intergenerational business transfer is emphasized. The course examines actual small business enterprise cases including underwriting benchmarks, best management practices, common denominators of problem credit, and credit scoring systems applications, including the ten golden rules for operating small business enterprises. Pressures on a bank’s traditional source of profit—the spread between interest income and interest expenses—have encouraged bank management to look to non-traditional sources of revenue and profits. Sources of Non-Interest Income focuses on some of these sources and addresses the managerial issues involved in entering into these areas. Among the areas discussed are brokerage services, insurance services, service charges, overdraft protection, mortgage banking, and merchant services. In the past few years, bankers have experienced and are experiencing a period of unprecedented economic challenge. Asset quality and loan performance metrics have improved for most. But, as competition once again begins to get “frothy,” these improvements will be tested. Capital preservation and liquidity are more precious to bankers today than ever before in our modern time. Virtually all markets are affected. These challenges are of a depth and breadth few have seen—let alone have experience at handling. While asset quality trends are improving for the industry, many banks continue to battle troubled borrowers and are desirous of avoiding a “repeat of the past.” Problem loans are a new reality for some. How will your portfolio respond to continued pressure? Are your internal management practices and board activities where they need to be? How has this environment affected your relationship with your regulatory agencies? Troubled Asset Resolution is designed to provide some assistance, guidance and provoke thought as to how you handle loan performance challenges in your shop and be positioned to effectively manage the next generation of problem loans that might possibly already reside on your balance sheet.